Local news including forthcoming agricultural show; invasive seaweed on boats; school news and awards; cut in housing budget for Argyll & Bute; Tiree Experience bus tours; A&B local plans published; an `Interview with God`; high fuel prices; bumblebees. Photograph of Hugh MacNeil (?) 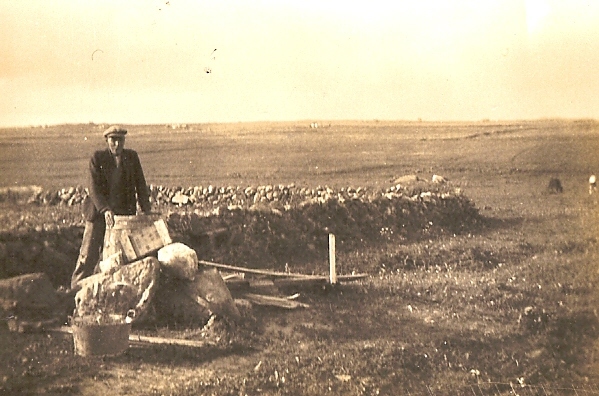 working outside Croft View, Balephuil, around 1950. Black & white photograph of a man (possibly Hugh MacNeill) chopping up a wooden crate outside his house – Croft View – at Balephuil around 1950. From a collection of photographs from the house of Ellen Kennedy (nee Eilidh MacNeil), Balevullin. Long, curved metal tongs `clobha` for gripping the base of a large pot on the fire.